The Dominikanerinnenkloster St. Gertud (Dominican Convent of Saint Gertrude) operated in Cologne, Germany, for nearly five and half centuries. An important center in connection with German mysticism in the 13th and 14th centuries, the Kloster survived the Reformation, however persistently poor finances led to its decline in the 18th century. After it was abolished during a wave of secularization on October 14, 1802. This diminutive book of hours was prepared by Dominican nuns at the Kloster St. Gertrud during the 1480s. Like some other German books of hours it lacks the calendar, Gospel lessons, and the two prayers to the Virgin, Obsecro te and O intemerata, however it includes additional liturgical texts, such as Offices for major feasts, as well as music for the funeral service. This copy may have been made for or by the prioress Magdalena Frankengruenerin (1481-1488), and remained in the convent until the eighteenth century. The Dominikanerinnenkloster St. Gertud (Dominican Convent of Saint Gertrude) and its associated church operated for nearly five and half centuries in the Neumarkt in Cologne, Germany. Led by the recluse Helwigis, the community was founded in 1257 and was affiliated with the Dominican order beginning in 1286/1287, becoming known for housing relics of the 7th century Gertud of Nivelles, a saint who was associated with the Benedictine Abbeys of Nivelles and Karlburg. An important center in connection with German mysticism in the 13th and 14th centuries, the Kloster survived the Reformation, however persistently poor finances led to its decline in the 18th century. After it was abolished during a wave of secularization on October 14, 1802, the nuns transferred to other communities and the buildings were sold or demolished. The text in this manuscript is atypical in many regards. The lack of a calendar and other elements common to most western European books of hours, and inclusion of additional texts and music, transforms a book meant for private, often lay, devotion, into a liturgical book for use by Dominican nuns. The manuscript ends with the text and music for the funeral service and the Offices for major feasts (ff. 183-271), reminiscent of a "sister manuscript" at Darmstadt, which concludes with 28 folios of liturgical prayers with musical notation for the communion of the sick and the funeral service. The importance of music in these manuscripts is noteworthy, especially in light of a contemporary chronicler's remark that the nuns at St. Gertrude were famous for copying beautiful Choir Books for the Divine Office. ff. 1-39, Hours of the Virgin, Dominican Use; Incipit cursus beate marie virginis, incipit, "Saluto te sancta maria regina"
The Hours of the Virgin are for Dominican use: the antiphon at Prime is typical of monastic orders, and those at Terce and Compline are specific to the Dominican order. The introduction to the Hours of the Virgin with Cursus and the double litany are further indications of Cologne origin, and the text of the Hours is the same in Darmstadt, HS 1005, which also begins, before the text of the Matins, with the prayer to the Virgin that invokes Gabriel's greeting, "Saluto te sancta maria." ff. 118-126, Litany, including the Cologne saints Gereon, Severin, Cordula and Ursula, and double invocations for the patron saints of the convent, saints Dominic and Gertrude; [f. 126v]; blank. ff. 183-198, De officio sepulture, incipit, "Non intres in judicium," noted (with music, "Subvenite sancti dei," "Antequam nascerer, novisti me," "Clementissime domine"); incomplete at the end; Funeral service, with musical notation. ff. 200-271v, Noted Offices for major feasts from Palm Sunday to the Assumption of the Virgin; (incomplete at the end). f. 1, Annunciation; The image echoes the Annunciation by Stefan Lochner (c. 1410-1451), the most important painter and illuminator in Cologne in the fifteenth century, painted in the 1440s for the chapel of the councilors of Cologne (now housed in the cathedral). As in the panel, Mary is kneeling at her prie-dieu at the left and turns her head to look at Gabriel who has just alighted from the right, perhaps through the arched doorway depicted in both images. 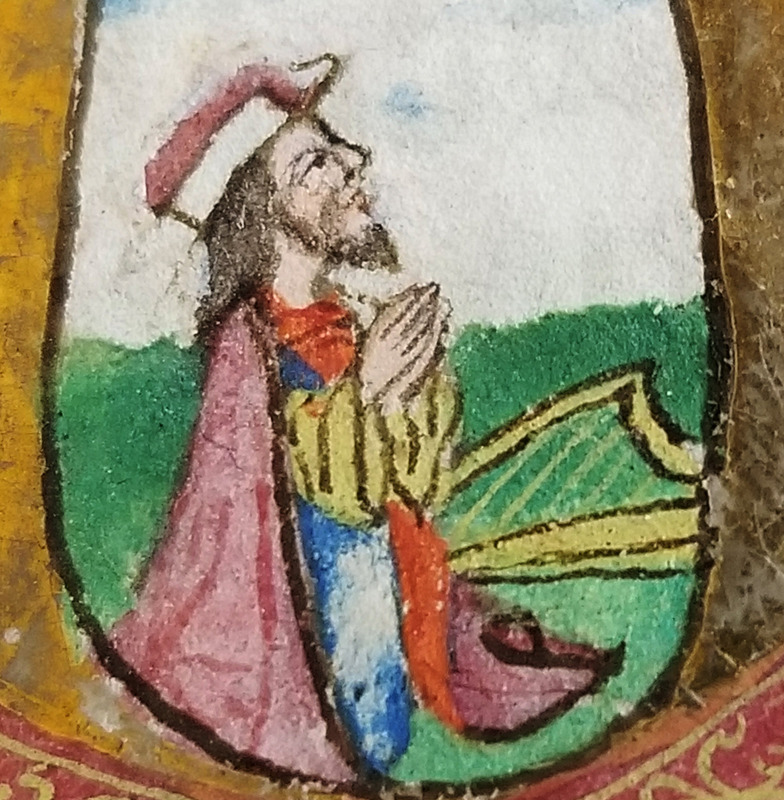 f. 107, David in prayer. f. 127, Christ at the Last Judgment flanked by the Virgin Mary and St. John. The composition, costumes and poses of the protagonists emulate the Last Judgement panel painted by Lochner around 1435-40 for the town hall or St Laurentz church in Cologne. The floral borders and initials with distinctive carrot- and bell-flowers, gold rinceaux, ribbon-like acanthus scrolls and gold pastilles testify to the Cologne "Goldrispenstil" (gold filigree decoration) developed by Lochner and adopted by subsequent local illuminators. Interestingly, the very small format of Lochner's devotional books was also influential: the famous Lochner Gebetbuch measures 107 x 80 mm. (Darmstadt, HS 70), almost the same dimensions as the present manuscript. The penwork forms, the dentilation of the marginal penscrolls, the forms of the flowers, the arrangement of the foliage and the colors used allow the dating of the present manuscript to the 1480s (cf. the Simmern Missal of 1481-1482, Kupferstichkabinett, Staatliche Museen zu Berlin, a Psalterium/Hymnar of c. 1470, Darmstadt, HS 855 and a Gradual of c. 1498, Cologne, Dombibliothek, Codex 229). The decoration in this manuscript resembles that of the Darmstadt Hours, also produced at St. Gertrude. Indeed, it appears that the same person painted the initials and floral borders in this manuscript and in the Darmstadt Hours (Hemfort, 2001, p. 84, plate 81). The figures in the three historiated initials, like those in Darmstadt, are crude and angular, their eyes are heavily outlined in black, and their hands gesture awkwardly. The same gold or white feathering occurs in the corners of the rectangular ground behind the initial. In the margins of both manuscripts one finds identical carrot- and cupflowers, a three-petal-flower with stamen protruding from its ripe pistil, ribbon-like acanthus leaves and pastilles and leaves in burnished gold. The two books would originally have been approximately the same size. The Darmstadt Hours is today a centimeter larger (116 x 86 mm), but the margins of the present manuscript appear to have been cropped slightly in rebinding. ii (modern paper) + i (medieval parchment) + 271 + ii (modern paper) folios on parchment, modern foliation in pencil, 1-271, missing five leaves at the end (collation i 10 ii10[-5, one leaf following f. 14, without loss of text] iii-vi10 vii10 [-5, one leaf following f. 63, without loss of text] viii-x 10 xi8 xii10 xiii12 [-9 and -12, two leaves following f. 124 and f. 126, without loss of text] xiv10 [-8, one leaf following f. 133, without loss of text] xv-xviii10 xix10[-5, one leaf following f. 179, without loss of text] xx10 [-8, one leaf following f. 191, without loss of text] xxi6 [-4 and -6, two leaves following f. 196 and f. 197, without loss of text, +7, f. 198] xxii8 xxiii10 xxiv12 xxv 8 xxvi12 xxvii8 [-2, one leaf following f. 249, without loss of text] xxviii14 [-10, one leaf following f. 264, without loss of text] xxix8 [-4 through 8, five leaves following f. 271, with loss of text]), leaves were excised without loss of textual or pictorial content (except at the end), perhaps because the scribe calculated the needed space (e.g. in quires ii and vii the scribe used only a singleton rather than a bifolium in the middle of a quire), partially cropped horizontal catchword f. 10v, two distinct codicological units: ff. 1-198 (quires i-xxi), ruled in brown ink (first and last lines extend into the margins), written in black ink in textualis bookhand on 14 lines (justification 70 x 52 mm), one- to two-line initials alternating in red and blue, three-line initials in blue decorated with purple penwork highlighted with green paint, two four- to five-line initials in burnished gold on a red rectangular ground in-filled with a flower and floral borders in colors and burnished gold (ff. 39, 66v), three five- to sixline historiated initials on a red/blue rectangular ground, ff. 1, 107, 127 (described below), square musical notation on 4- line red staves with four lines of text and music per page; and ff. 199-271 (quires xxii-xxix), ruled in brown ink (justification 67 x 45 mm), written in black ink in textualis bookhand (by a different scribe) on 15 lines, liturgical instructions underlined in red, one- to two-line initials alternating in red and blue decorated with red penwork, two large puzzle initials in red and blue (ff. 202v, 261v), slightly cropped, but in excellent condition. Bound in seventeenth-century black morocco, blind-tooled with double lines framing the boards, spine with three raised bands, clasps, upper latch-pin lacking, outer edges gilt. Dimensions 108 x 77 mm. Acquired from Les Enluminures, Nov. 2018. A probable ownership inscription written in pencil inside the front cover reads "S[chwester] Maria Catharina Drieschen." A native of Koblenz, Drieschen professed to St. Gertrud in 1740, aged 23, and was sister of Maria Margaretha Drieschen, who served as Prioress in 1798. The description of the manuscript, illustrations, and pagination were provided by Les Enluminures, from whom the volume came to SCUA, and was edited slightly, primarily for length. Processed by I. Eliot Wentworth, Nov. 2018. Cite as: Dominikanerinnenkloster St. Gertrud (Cologne, Germany) Book of Hours (MS 1057). Special Collections and University Archives, University of Massachusetts Amherst Libraries.